Over the past few decades, the American composer John Adams, along with his ‘minimalist’ compatriots Steve Reich and Philip Glass, has steadily established a place in the consciousness and (dare one say) affections of ‘mainstream’ classical audiences and performers. Gone are the days when these composers’ works were confined to a niche market; pieces like Adams's Nixon in China and the controversial The Death of Klinghoffer (based on the 1985 hijacking of the cruise liner Achille Lauro) are now familiar from high-profile productions in major opera houses, and his orchestral works are regularly played by the great European orchestras. 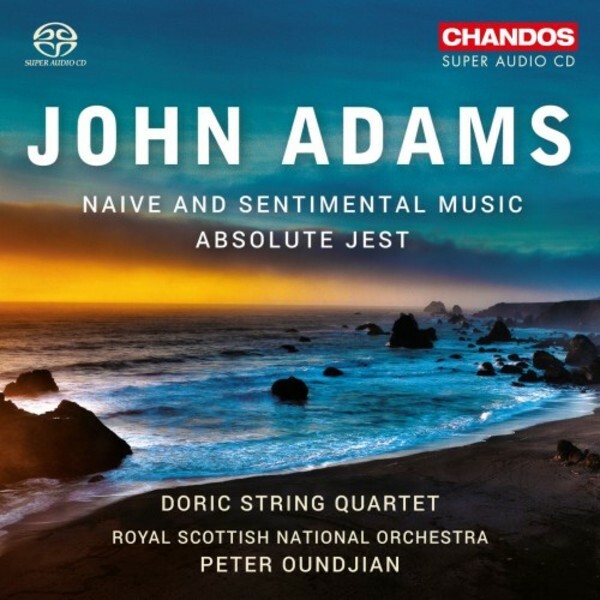 The Chandos label has already featured Adams's approachably post-minimalist, neotonal music on several CDs, notably the seminal Harmonielehre and the Doctor Atomic Symphony performed by the Royal Scottish National Orchestra under their Canadian music director Peter Oundjian (CHSA5129). Now the same forces return for two further large orchestral works by Adams: Naive and Sentimental Music (1997-98) and Absolute Jest (2011-12), and the good news is that they're as appealing and compelling as any of Adams's music, with a confident command of orchestral timbres and a sure sense of long-term pacing and architecture. Composed for the centenary of the San Francisco Symphony in 2011, Absolute Jest arose partly in response to a performance of Stravinsky’s Pulcinella suite, in which the Russian composer famously adapted the music of Pergolesi to a neoclassical idiom. Adams, however, turned to one of his lifelong musical loves, Beethoven, utilising motivic and rhythmic cells from the scherzos of the Ninth Symphony and the late quartets in particular to weave a fabulously intricate web of textures and polyphony in which the full orchestra sits alongside a lightly amplified string quartet (on this recording, the marvellous Doric String Quartet) in music of constantly shifting perspectives. Just as inventive but very different in mood is the three-movement Naive and Sentimental Music, scored for large orchestra including five percussionists and a steel-stringed guitar. Once again, the title is deceptive. Adams takes as his point of departure Friedrich Schiller’s essay On Naive and Sentimental Poetry, in which Schiller suggests that poets fall into one of two categories: for ‘naïve’ poets the act of creation is a purely natural and simple one (examples include Homer, Shakespeare and Goethe), whereas ‘sentimental’ poets base their work on their own feelings and on conscious reflections on their subjects. For Adams, large-scale orchestral music (and this is one of his most ambitious non-operatic scores) is both sentimental and naïve, coming naturally and spontaneously to him but still requiring a certain reflectiveness as it engages with the traditions of the past. The first movement is dominated by a ‘naïve’ cantilena-like melody that gradually takes on more reflective, self-aware qualities as it ‘leaves the nest and ventures out into the wide world like a Dickens child’. In the second movement (‘Mother of the Man’, inspired by Busoni’s Berceuse élégiaque of 1909, in which a grown man stands by his mother’s coffin), the sense of lost innocence is enhanced as the guitar soloist (here the excellent Sean Shibe) comes to the fore. The third and final movement, ‘Chain to the Rhythm’, has a toccata-like brilliance and momentum, with a vast array of percussion dominating the timbres. At forty-five minutes this is one of Adams’s most absorbing and accomplished works. Like Absolute Jest, it receives a thoroughly committed, urgent and persuasive performance from Oundjian and the RSNO, complemented by Chandos’s vivid SACD sound and fine booklet notes by Mervyn Cooke.